We know that no matter how good our software is you will only realise it's true benefits if it is used effectively in the correct way. This applies to all levels of users, administrators and managers as well as the technical teams who support the application. 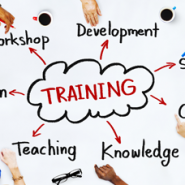 For this reason we offer a number of approaches to training on CABS software to fit with the preferred approach of the client and the agreed overall project and implementation approach. So whether it’s standard classroom courses, bespoke courses, CD-ROM/Web based activities and/or coaching, whatever it takes to achieve your goals, the appropriate use of CABS professional services will make all the difference. Our experienced Professional Services Consultants and Application Advisors present all of the classroom sessions, workshops, seminars and formal training courses. On a daily basis their jobs involve them in the real-life implementation of CABS Solutions and the provision of software, technical or project consultancy. So attendees can be confident that the course is being delivered by somebody with first-hand experience of the subject under consideration. We also believe the whole process should be efficient, effective and economical. To do this we use proven Accelerated Learning Techniques and comprehensive evaluation methods. This leads to high knowledge retention/use for the learners and quantifiable results for the business. We are pleased to be able to offer these services either at a suitable venue selected by you or at our high quality training facilities chosen to suit your requirements.